Overall, the process is really quite simple. To begin, you'll need your base (crazy, right?) 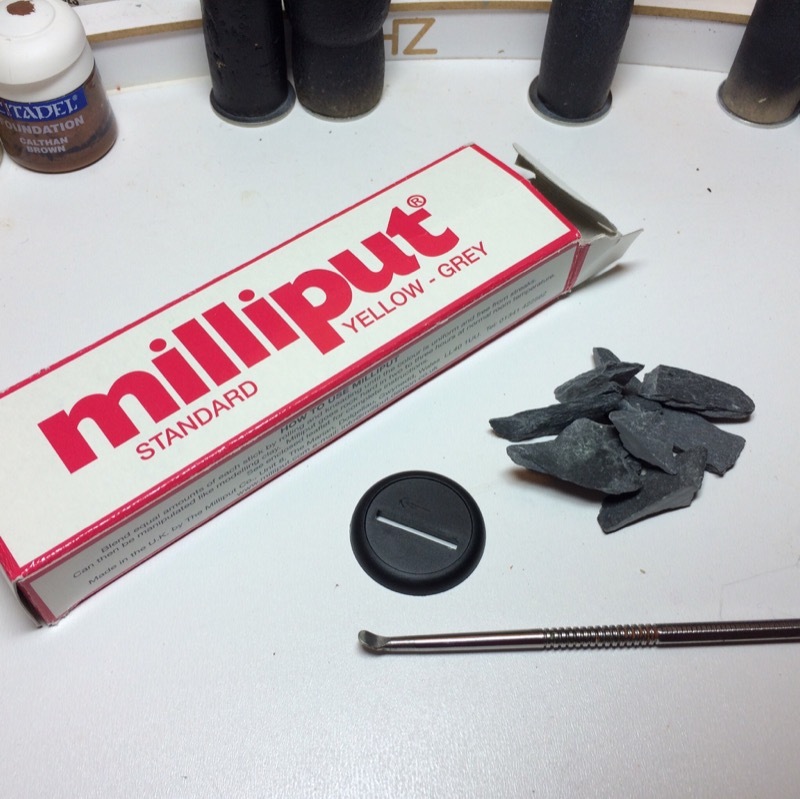 some milliput (although green stuff or other putty would likely work just as well), some flat-ish stones (these are some small chunks of slate) and a tool to press into the putty with. Step 3: Now to get rid of that marshmallow look, using a rock (or several) start pressing in to get a more realistic texture. 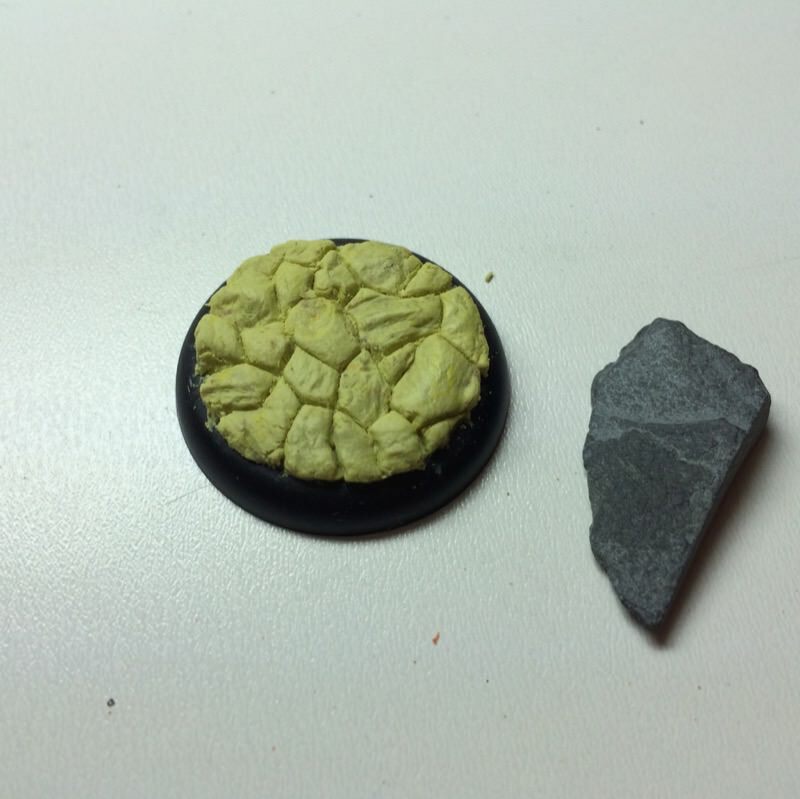 As you do this, the tops of the rocks will flatten and the gaps you sculpted will get pretty thin. You may find it necessary to go back and forth to open up wider gaps, then press down to get your texture again. 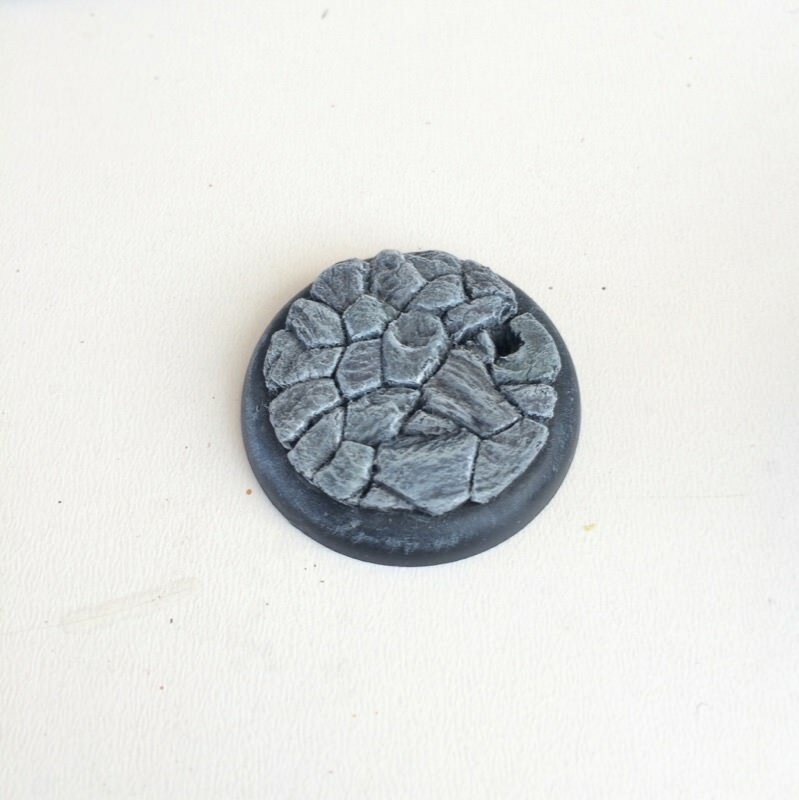 You can press down to get a very flat look across all the stones or, as in the case below, leave a little more variation in height for a rougher look. At this point you may also want to think about how you're mounting your mini. If you're pinning, you can get away with drilling after everything's dry. In my case, I didn't risk pinning Senpu's thin ankles and so just clipped off all but a chunk of metal on the slot he was mounted on. I pressed this into the base so I had an easy hole to mount him in when I was finished. I usually leave the milliput to dry overnight. In the morning (while the coffee is brewing) I then sit down with a hobby knife and clean things up. 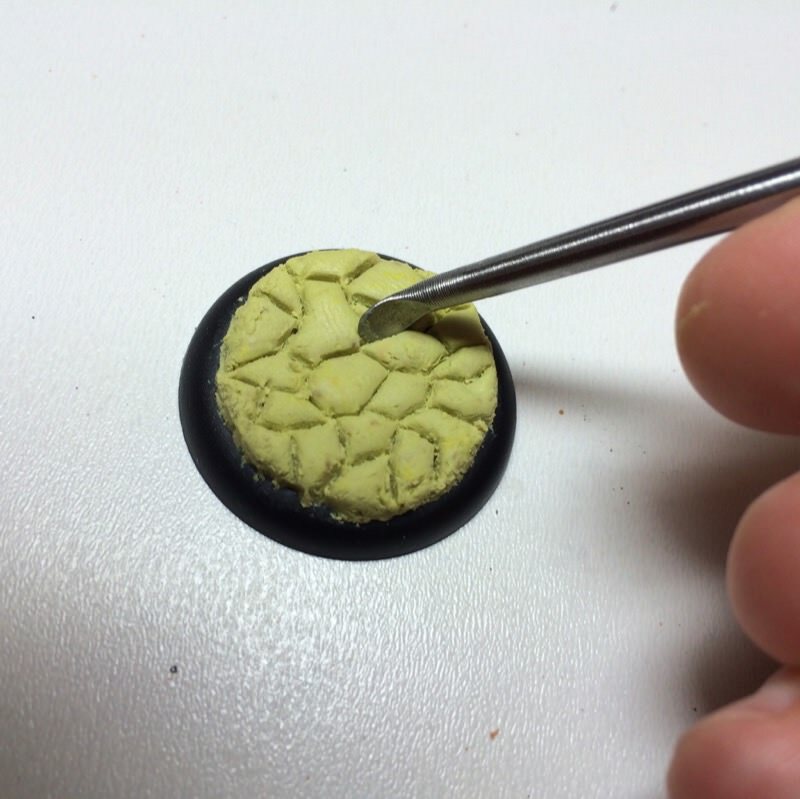 This can mean fixing some indentations, cleaning off millput that dried around the edge of the base, or exaggerating gaps between the edges of some stones. As with the sculpting, this is going to be pretty quick and easy. Let's go. 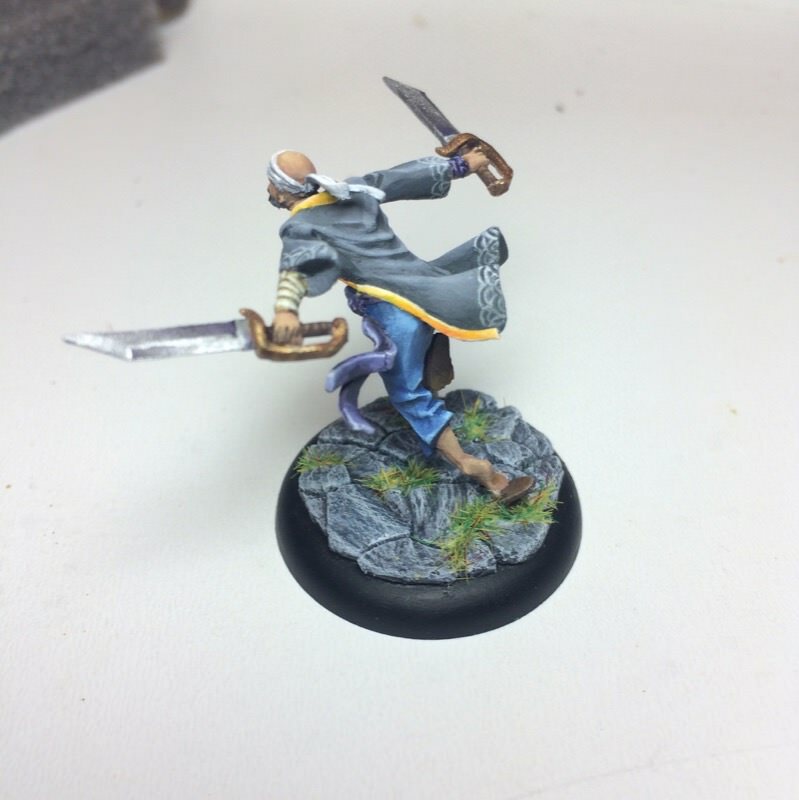 Step 2: Base coat. I used VMC London Grey, but any middle grey tone will do. 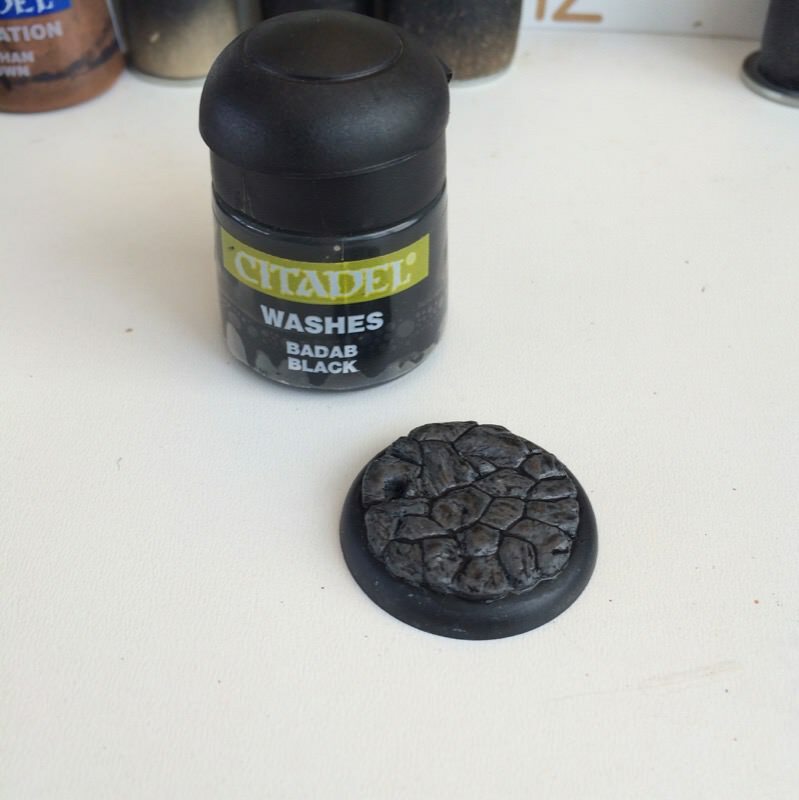 Step 3: Wash it with a black wash, ink or very thinned down paint. 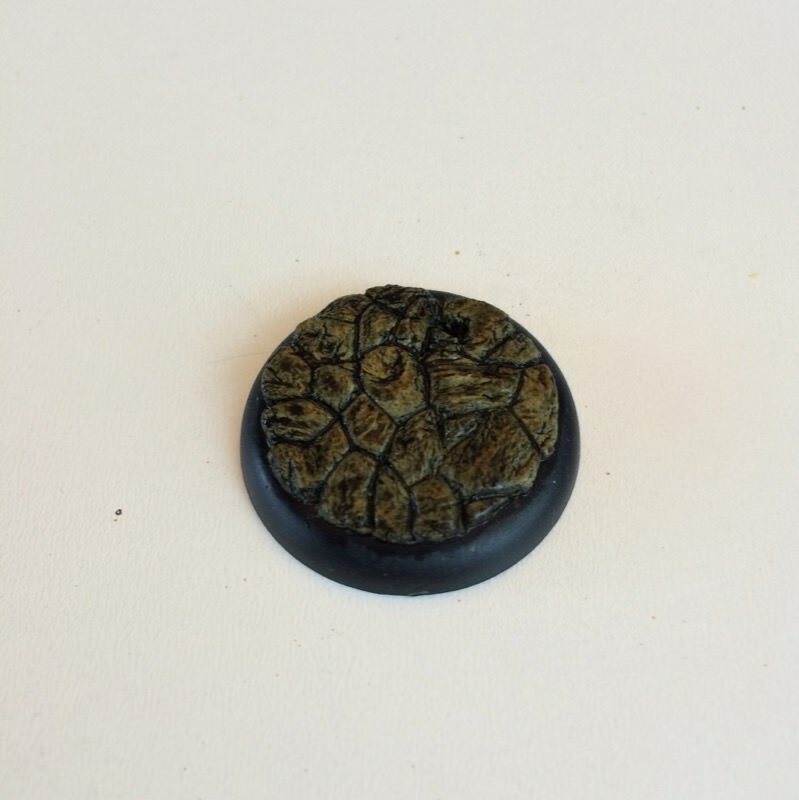 I'm still making use of the old GW Badab Black wash (now Nuln Oil I think) which I pretty generously slathered all over the base. Don't worry about how dark it gets -- we're gonna fix that soon. Step 6: More Drybrushing! We're going to progressively work the base up to the tone we want. 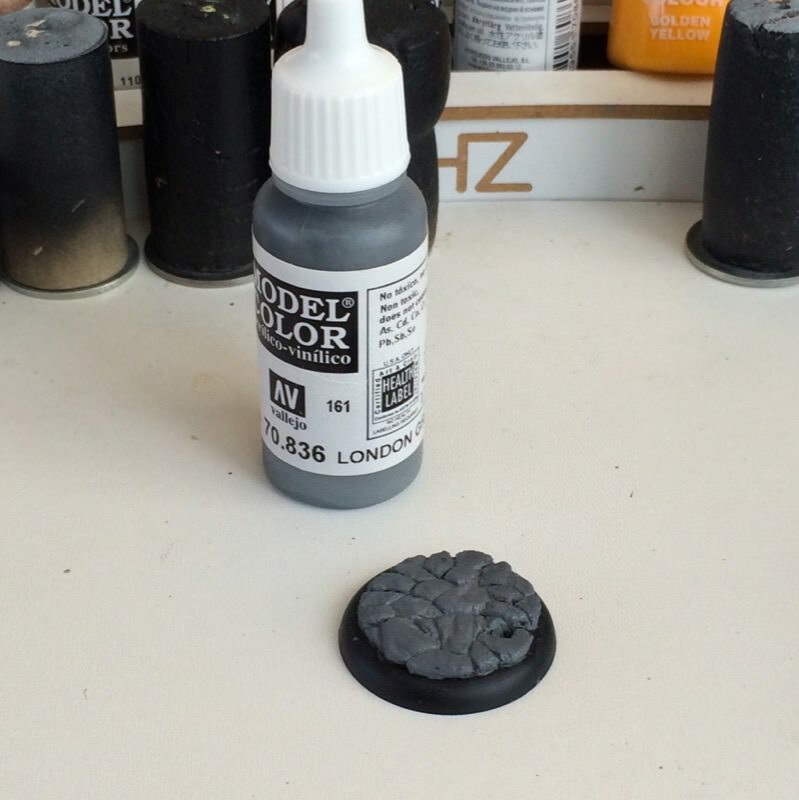 I start with the same VMC London Grey base coat color mixed with some white and keep going lighter until I'm drybrushing pure white to really highlight the edges. 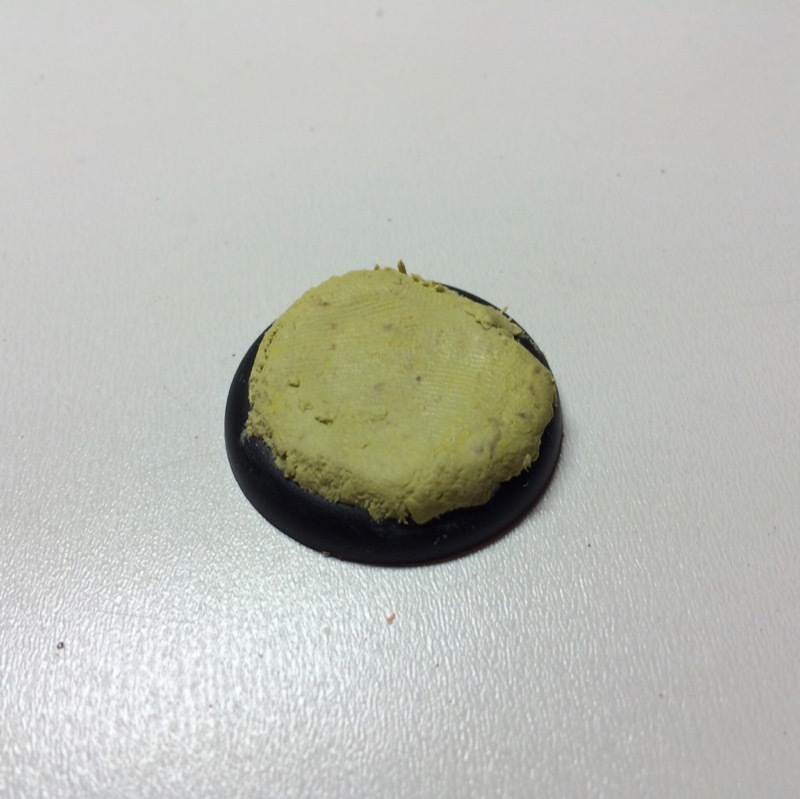 Step 8: No photo for this one, but after all that drybrushing, now is a good time to cleanup the edge of the base with black. This is always an immensely satisfying step for me! 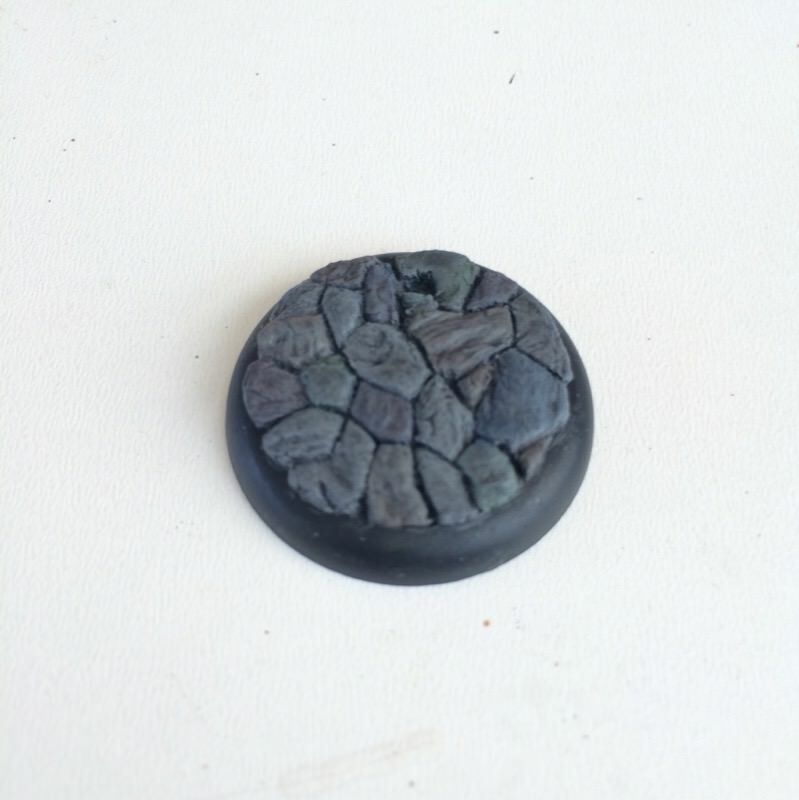 ...and there you have it: one cobblestone base. I tried to take a lot of pictures and break it down step by step, so it may appear like there's a lot to it, but really each step is very quick. 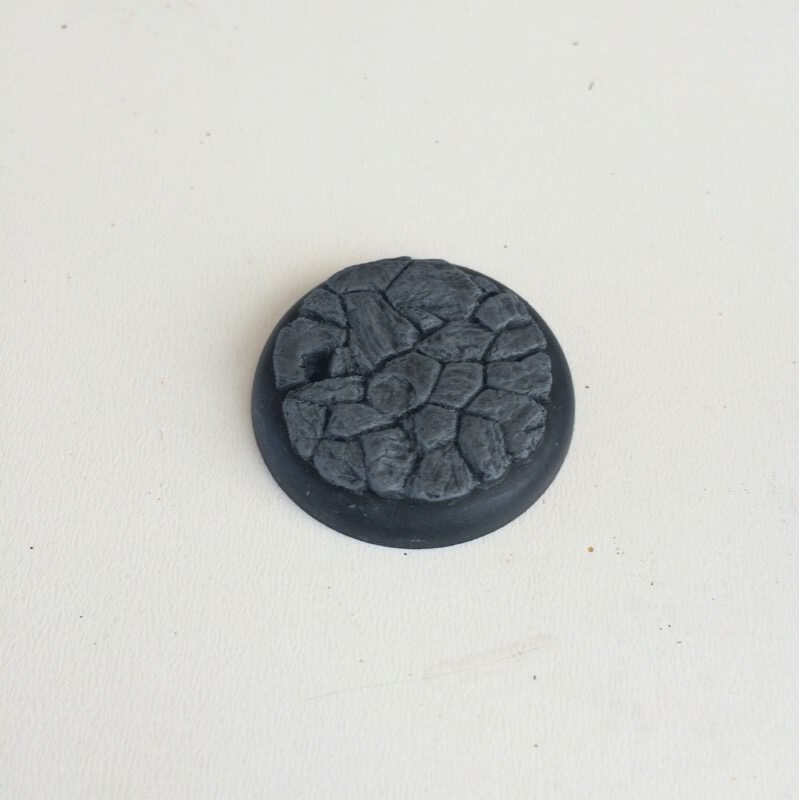 There are some really nice cobblestone resin bases out there you could buy, but when this is so easy to create, why not go custom?